The photographs featured on this page are by Veronica Diaz at www.veronicadiazphotoart.com. Located on 115 acres of open fields and woods, Appel Farm Arts & Music Center offers a rustic and uniquely unforgettable setting for your wedding! Exchange your vows under the vaulted ceiling of our Pavilion, silhouetted against the setting sun and woods, or on the patio of our dining facility, with our organic garden at your back. Host your reception in our dining hall which seats 250 guests and has a fully- equipped kitchen for your caterer’s use. Our grounds feature beautiful groves of trees, a contemplative garden for your guests to explore, two bonfire pits for late night revelry and sleeping accommodations for 175 to 250. Spend the weekend at Appel Farm! Our doors open for your use on Friday at noon to decorate and prepare for your wedding. You and your bridal party can get ready in our Cubicle Suite, which includes 3 bedrooms (which sleep up to six), a sitting area, a kitchen and a full bathroom. In addition to your wedding reception, you can host a rehearsal dinner on our lovely grounds – under our pavilion, on our back patio or in our dining hall – and you can end your weekend with a Sunday morning brunch, all with the caterer of your choice. Your guests can sleep over both Friday and Saturday nights with a bonfire on either or both nights. Wood included! Tennis, basketball, a life-sized checker board and a gaga pit are available for your guests to enjoy. This price includes the use of our Pavilion, Dining Hall, Cubicle Suite, and our South Dormitory which sleeps up to 36 guests from Friday at noon until Sunday at noon. Also included, one bonfire with s’mores! Does not include tent rental, catering, linens or the cost of event insurance. 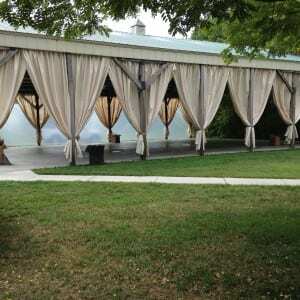 Our gorgeous outdoor Pavilion Curtains are also included. Do you want the convenience of an air-conditioned reception space with a fully-equipped kitchen and the natural beauty of a rural farm setting? Our South Jersey Sky Package includes the use of our dining hall, our back patio, our pavilion and our Cubicle Suite. Tie the knot on our back patio or on our Pavilion framed by our gorgeous organic garden and the expansive South Jersey sky, host a sit-down reception in our dining hall and then dance under the stars. You and your bridal party can get ready in our Cubicle Suite which includes 3 bedrooms that sleep up to six, a sitting area, a kitchen and a full bathroom. After your reception, continue your celebration with a bonfire at one of our two bonfire pits. This price includes the use of our Pavilion, our Dining Hall for your reception and a Sunday brunch, our Cubicle Suite, and the use of our bonfire pit from 9am on Saturday until noon on Sunday. Does not include catering, tent rental, linens, fire wood or the cost of event insurance. Enjoy the beauty of a natural, outdoor wedding! Our covered Pavilion is surrounded by verdant open fields and woods and faces the setting sun. It can accommodate up to 150 guests under its vaulted ceiling. Your caterer has full use of our kitchen and you and your Bridal Party can get ready in our convenient Cubicle Suite. After your reception, head over to one of our bonfire pits for a late night celebration. This price includes the use of our Pavilion for your reception and ceremony, our kitchen facilities, Cubicle Suite, and the use of our bonfire pit for one day only, from 9 am to 1 am. Decorating may begin the day before at 12 noon and post-reception clean up must be completed by noon the day after. This price does not include chairs, tables, tent rental, catering, fire wood or the cost of event insurance. Our kitchen will be available the day of your event only, beginning at 9am. Are you hoping for a more casual and informal feel for your special day? Did you want a local barbecue/rib joint or a few specialty food trucks to cater your event? Our Pavilion Party Package allows you to host your wedding ceremony and reception completely outdoors under the sky and stars. 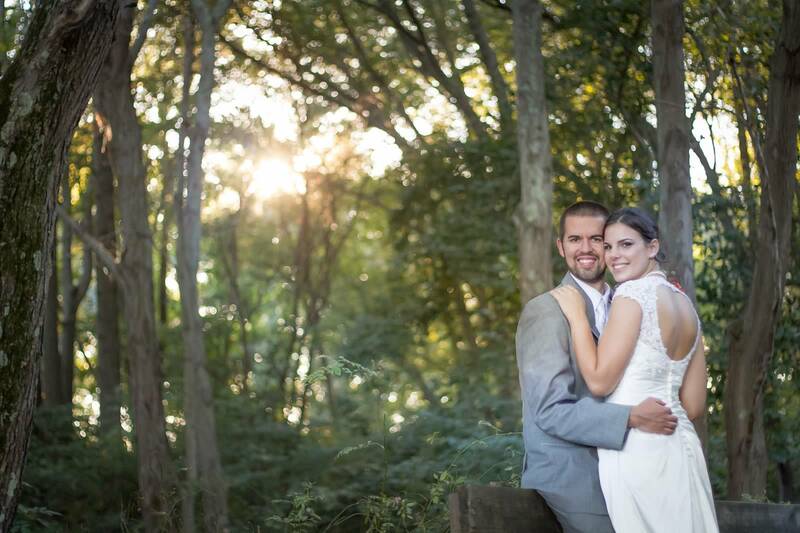 Our beautiful grounds will make a lovely setting for your natural wedding. Hold your reception on our covered Pavilion and have your caterer set up shop on one of our adjacent grassy fields. Our Cubicle Suite is available for your pre-event use. After your reception, continue the celebration with an evening bonfire. South 14, 15 or 16: $800 for the whole bunk area. Accommodates 36 total. North 1, 2, 3, 4, 5, 6, or 7: $225 per bunk or $1500 for the whole bunk area. Each bunk accommodates 10. Coop: $1200 for the whole bunk area. Accommodates 60 total in 5 bunks. Hill: $1200 for the whole bunk area. Accommodates 60 total in 5 bunks. Cubicle Suite: $140. Includes 1 day and overnight use. Accommodates 6 guests. Facilities must be cleaned and vacated by 12pm on the Saturday or Sunday morning following your event. All trash should be taken out and rooms should be left in the same condition in which they were found. For Sunday weddings, decorating may begin at noon and facilities must be returned to pre-rental condition by Monday at noon. $500 secures your date but must be received within 48 hours of a verbal reservation. Your deposit cannot be deducted from your final payment but will be returned after a visual inspection of the property the week following your event. 50% of your total balance if due 60 days prior to your event. Your balance is due 7 days prior to your event. Should you need to delay payment to less than 7 days prior to your event, only a Cashier’s Check, Money Order or Credit Card will be accepted. Either party may cancel up to 60 days prior to the scheduled date of your event with written notice. A refund will be given less a $75 administrative fee. Refunds with less than 60 days notice shall not be given. Additionally, these gorgeous curtains are available to rent for your outdoor wedding! The cost is $350 and includes installation and de-installation.